Make Your Own Patches With Mini Embroidery Patterns! There are lots of ways to make DIY embroidered patches or badges, but they all start with a pattern. The challenge can be finding a pattern that is the right size and level of detail. Look no further than this selection of mini embroidery patterns that would all make adorable patches! Some are designed with badges in mind, while others made it on the list because they'll easily work for this type of project. With so many choices, you'll find plenty of patch patterns to stitch! These PDF merit badge patterns from Speckless are as clever as they are cute! With badges like "beating the odds" or "cool as a cucumber," you can display your embroidered achievements or award them to a friend. DMC is known for their embroidery floss, and with all of the amazing free patterns they offer, you'll never run out of ideas for stitching. The Good Girl Sheet is a set of tiny patterns that will work for patches as well as stitching directly onto bags, tees, socks and more. They also have a Bad Girl Sheet that will mix in with these perfectly! Origami fans, get ready to stitch! The Craftinomicon's origami animal patterns aren't designed to be pin or badge designs, but they'd work great as one. The lines are simple to stitch and they would look so cute attached to a backpack or denim jacket. The free PDF includes a bear, a dog, a squirrel and an elephant. This collection of 12 miniature embroidery patterns features a mix of styles, so no matter if you want to make patches that are inspired by emojis, nature or embroidery, you're all set. They're pre-sized for badge stitching and best of all, they're free! One of the fun things about embroidering patches is that they are small and, therefore, a fast finish. That's the inspiration for this set of 60 Quick-Stitch patterns by September House. The motifs are grouped by food, animals, plants and more fun designs. This one pattern set has something for everyone! Celebrate some of your favorite holidays by making patch-style pins! Shirley from Hudson's Holidays shows off her mini hexie patterns in necklace form, but they can easily be stitched up as hexagon-shaped patches and pins. Most of the designs are connected to a holiday, but there's also a kitty, a unicorn and a few others that are appropriate for any time of the year. Not every patch needs to be a picture of something and sometimes it doesn't even need a pattern. 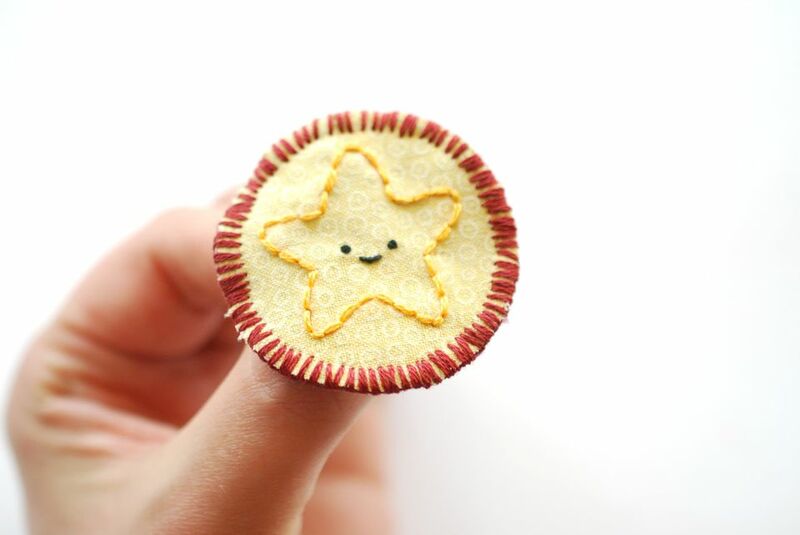 MagaMerlina shows how to make a miniature mandala that would be beautiful stitched into a pin. The best part is that you can easily make it your own and no two designs will be the same! At The Graffical Muse you'll find these adorable bunny patterns in JPG format. And who doesn't love cute bunnies? Stitch all four of them for a set of patches to keep or share. While you're there, check out her fantasy creature patterns, tattoo-style designs and more! When back-to-school time comes, encourage your kids with merit badges that celebrate their school day accomplishments! The free PDF from Wild Olive includes designs for test scores, grade levels, subjects and a few more generic school icons. If you're a teacher, you could even stitch some of these to use in your classroom. For more whimsical patches, you'll love these mini embroideries by LiliPopo. The faces are so sweet, as are the floral designs that accompany them. Stitch them up to look like you and your sisters for a customized wearable gift!